One very healthy breakfast recipe which is an excellent choice for someone managing their weight and blood sugar, is a bowl of fresh fruit in season with some yogurt, nuts, and flaxseed meal. Good quality yogurt, with no added sugar, is full of the "friendly" bacteria needed for a healthy gastrointestinal tract. The balance of good, healthy flora (bacteria) is crucial for good digestion and a normal functioning immune system. Getting enough good bacteria may help prevent yeast infections. 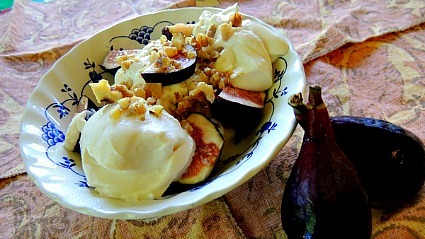 This recipe has figs but any fresh fruit that's in season where you live will be delicious. Buy the fruit that's ripe at your farmer's market. Fresh figs are a delicacy and full of good nutritional benefits. They are perfect for people needing to manage their weight. *Other fruit ideas: 1/2 mango, 1/2 papaya, pears, apples, nectarines, berries, oranges, peaches, plums, whatever is in season, combined or by itself. If it's winter and there's not much available, buy frozen fruit. Sprinkle a teaspoon of cinnamon on top for flavor and to keep your blood sugar low. This is one of our printable low glycemic index recipes. The more fiber you eat the easier it will be to lose fat and manage your weight. Figs are a terrific source of fiber. They're impossible to get out of season and because they are quite perishable they taste best fresh. Just three figs contain about 5 grams of fiber. They stay in the stomach longer and make you feel full so you won't feel like snacking. They're also sweet and satisfy the craving for something sweet to eat. Figs are a great source of potassium which helps to control blood pressure and stabilize cholesterol. Three figs contain 10% of your daily requirement. Figs also contain some B6. Three figs provide 100 mg. calcium for strong bones and a healthy heart and some manganese for strong bones and wound healing. Yogurt is an excellent source of calcium and protein. Cultured dairy products like yogurt and kefir are the healthiest dairy products for you. With this recipe you're also getting fresh fruit in season with all of it's vitamins, antioxidants and minerals and essential fatty acids in the walnuts and flaxseed meal. The walnuts have about 50 grams of protein. Low fat traditional Greek yogurt, The Greek Gods and Chobani brands have to be tasted to believe how good yogurt can be! Plain yogurt has no added sugar. You will see some grams of sugar on the label. Plain Brown Cow Greek yogurt also an excellent brand, has 13 grams in an 8 oz. serving. However, this is the natural sugar in the milk and will not raise your blood sugar. You're also getting protein in the walnuts and yogurt which helps to keep your blood sugar low. And you could sprinkle some cinnamon on top that will contribute to maintaining low blood sugar. The health benefits of this healthy breakfast recipe will change a bit with each fruit since they each have different but potent phytochemicals and antioxidants. Lecithin consists mostly of the B vitamin choline and contains linoleic acid and inositol. It is derived from soybeans, a lipid with many health benefits including protection from cardiovascular disease and support for brain and nerve function. Lecithin promotes energy and protects the organs and arteries from fatty buildup. Like I said, it's a healthy breakfast recipe especially when you add the flaxseed meal and lecithin. And it tastes as good as it looks! Breakfast is your most meaningful meal of the day because you are breaking a fast and it will set you up for the rest of the day. You want to start your idea out right - no sugar spikes - some protein, good fats and low glycemic carbohydrates are essential. When you have a filling breakfast that wakes you up and gets you moving and sustains your energy until your next meal, you will be making wise food choices all day long! Return from Healthy Breakfast Recipe to Low Glycemic Recipes. Return from Healthy Breakfast Recipe to Lifetime Fat Loss home page.